I Spy a Good Show? This isn’t actually the first time I’ve talked about Joker Game on the site. I actually took a look way back in Spring 2016 when the show was actually airing. At the time, I was only partially through and was watching it in Japanese. You can read my thoughts on it from then here (I’ll be referring to some of my thoughts there so you may want to read it). This time I decided to watch the show dubbed via VRV to see if my thoughts changed. With that, did Joker Game manage to be a good show in the end? Did the English voice acting improve its quality? Let’s find out! Before I delve too deeply into my thoughts on Joker Game let’s take a look at the opening theme. Just take a moment to watch it. From this opening, what kind of show are you expecting? Obviously, a spy show, but what exactly about it? Action, political intrigue, mystery, or just what exactly? The thing is the opening gives me this Baccano! feeling that has me excited but the show isn’t really any of these things. Sure, sometimes there are aspects of various genres here or there but overall just what is Joker Game trying to be? If you are unfamiliar, Joker Game is based on a novel of the same title. I’m sure that novel is great, but the anime adaptation leaves a lot to be desired. Let me clarify, Joker Game has cool ideas and could be a great show. The real problem is in its presentation because the intent is very obvious when you actually watch it. The show’s tone indicates that the series wants to be smart and have its audience think, but contradicts itself by spoon-feeding much of the information to the audience. 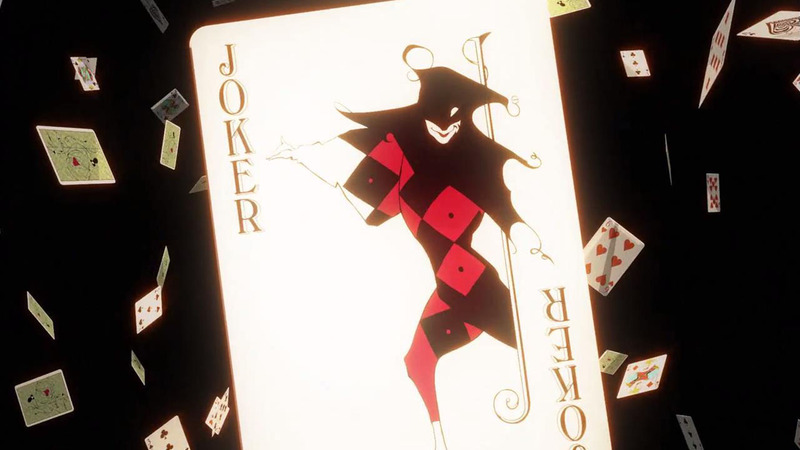 Depending on how well read you are on certain topics and how much you are paying attention, a lot of Joker Game’s ideas are going to be overly basic. Since this is modeled on real life history, there are whole episodes that are pretty silly if you know anything about the political climate of the Second World War or Japan’s aversion to the use of spies. Now, on its own this isn’t much of a problem. The real issue is that Joker Game constantly presents unsolvable mysteries. I’m sure in the novel, which I have not read, these mysteries come off well and are intelligible. However, in the anime, they are presented in a mess. For starters, you really do need to have the proper context of the setting, so in that way it forgives my previous point, but at the same time has the audience assuming a lot of other things that are not obvious (even to actual Japanese people). It’s an odd line to startle but Joker Game does not do it well. The mysteries always seem fair in hindsight but if you are actually trying to solve them in real time, they are literally impossible with only two exceptions. There is always a piece of information deliberately withheld from the audience. Why? Since a majority of the show ends up revolving around a larger mystery with a smaller vignette style mysteries as stepping stones, I simply can’t comprehend why information would ever be obscured. With that, I have already answered why in my previous quote. The show wants to come off as this sleek and smart show, but it fundamentally fails at actually setting anything up in a rewarding fashion. So, maybe then the real focus is on the action or political intrigue. Here, I have to disagree as well. There is very little action in Joker Game. So clearly this is not the focus. That only leaves political intrigue, and to the show’s credit, when it comes to Colonel Yuuki that does seem to be the focus. Unfortunately, only about a quarter of the show is actually dedicated to furthering that story beat. This is weird because that is what Joker Game is really about in terms of the bigger picture. This isn’t to say I didn’t enjoy any aspect of Joker Game. I like the OP a lot and there are a few episodes that are generally acceptable. However, a lot of my enjoyment comes out of poor direction and strange presentation that ends up being unintentionally hilarious. For example, how does one character keep a live pigeon stuffed in his skin-tight suit without it dying or ever making noise despite how he moves around? 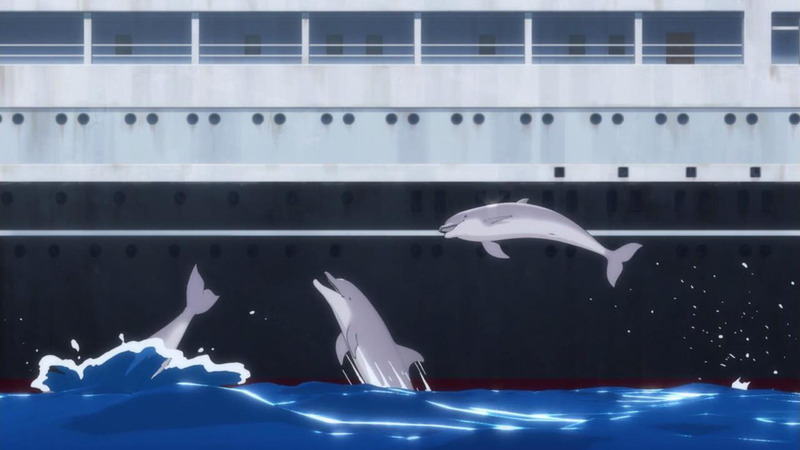 Or my personal favorite, did you know that spies can summon dolphins from the ocean at will? I certainly didn’t. Really, what I originally wrote back in 2016 remains true today. On the whole, Joker Game is mediocre at best but would be worthwhile for people who are either new to the spy genre or just seeking another spy fix. That’s really about it, there just isn’t enough there. “But Jon, what about the English language audio?” I hear you asking. For the second time over I did watch this in English and I will admit that it did improve the show for me in two ways. The first was significant in that I could tell which character was which. One of my original complaints was that the design of characters (outside of one group shot) were not easy to tell apart and I just didn’t know who was important to what and all that. English audio solved most of that. The second improvement was more minor. I was able to better follow a few story beats that confused me the first time through. This allowed one mystery to become solvable that wasn’t when I originally watched it. That’s why there are two exceptions to the unsolvable mysteries. This brings me to the final episode and the biggest sin that Joker Game commits. After so many unsolvable mysteries and a decent place to end, it decides to go for one extra episode. This episode has a laughably easy mystery and just kind of ends. It does circle back to how episode one starts, but considering that the second-to-last episode (which is a two-parter) ends the series outright, this final episode feels wholly unnecessary. I can make the argument for why it might be there and the intent behind it, but like everything else, the execution is dreadful. Sorry for harping on this one so much but Joker Game is a series that I wanted to like and it kept falling short over and over. I know I’m in the minority on this one though so maybe it’s just me. You can watch the show on Crunchyroll subbed or dubbed over at VRV if you happen to live in the US. Personally, I’d recommend the dub since it is just a bit easier to follow that way but to each their own. You can also purchase the show from Rightstuf if you’d like to own it. Did I change your mind about Joker Game or did you really enjoy it? Let me know in the comments. This article is dedicated to Sam C. for being an awesome Patron. Consider becoming one too and helping me out. Just click the button below for more details. As always, thanks for reading and I hope to see you back here at Jon Spencer Reviews again soon! I feel like your writing style is a bit roundabout for me (I like to be really direct and make points as quickly as possible), but you make a lot of good points about the show nonetheless. Overall, I enjoyed your article and will be awaiting more content! Summon dolphins at will? I had no idea Aqua Man worked for the Japanese secret service. Lol, who could have guessed? I wanted to enjoy Joker Game but ultimately I felt it fell short of what it wanted to be. It is still a reasonable watch, with some flaws, but it isn’t something I plan to rewatch at any point. Once was enough for me. Fair enough. It’s just too bad that the show wasn’t super great because there aren’t a lot of spy shows in anime.